AdipoLife™ DfKt™-1 Adipogenesis Medium is optimized for the differentiation of Human Adipose-derived Mesenchymal Stem Cells (HMSC-Ad) and Pre-Adipocytes (HNSC-PA) into adipocytes. AdipoLife™ is offered in a kit format composed of basal medium and associated supplements and differentiation factors called DifFactors™. This kit allows you to prepare fresh medium in your laboratory, extending shelf life and enhancing performance. 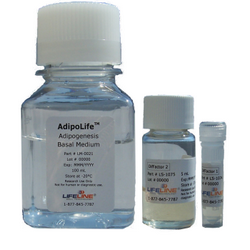 AdipoLife™ Basal Medium is provided in a 100 mL bottle. The remaining DifFactors™ are packaged in a convenient gas-impermeable pouch for easy storage. In comparisons with commercially-available media, AdipoLife™ DfKt™-1 shows superior efficiency of differentiation as is demonstrated by the greater accumulation of lipid vesicles. Shown above, left: Human Mesenchymal Stem Cells -Adult, passage 4, 4 days after inoculation with approximately 4,500 cells/cm2 (100X). Shown above, middle: Human Mesenchymal Stem Cells -Adult differentiated into Adipocytes using AdipoLife™ DfKt™-1 and stained with Lifeline® Oil Red O Lipid Staining Kit, post 3 weeks differentiation (200X). Shown above, right: Human Mesenchyma Stem Cells -Adult differentiated into Adipocytes using a competitor adipogenesis differentiation kit and stained with Lifeline® Oil Red O Lipid Staining Kit, post 3 weeks differentiation (200X).